I have a confession to make: I’ve never liked okra! Being the veggie aficionado that I am, I cannot say that about many vegetables… But okra is different. It’s not the taste that I object to, but the texture — ah yes… the slime factor. For the last two years I’ve looked at the gorgeous okra pods that appear every summer at my farmers’ market and let out a big sigh… if only I liked okra! 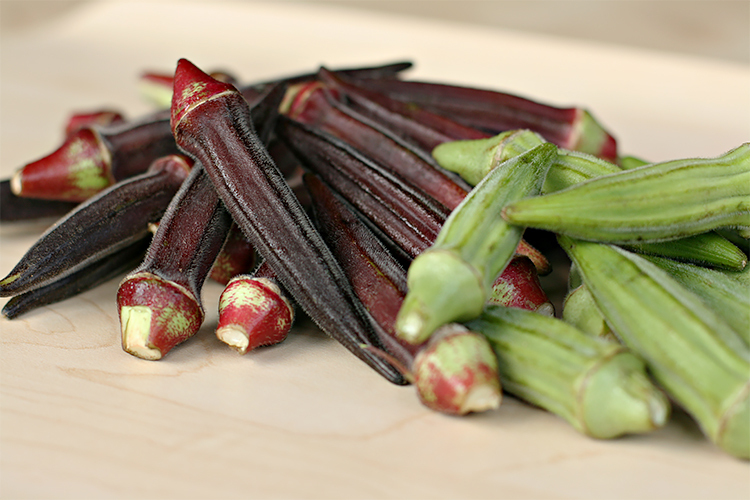 Then, a couple of weeks ago, I spotted okra that wasn’t green, but a beautiful burgundy color — almost purple! I was seduced and without fear bought a bag full of them. On the way home it hit me like a lightning bolt: “If I sliced the okra super-thin and fried it, surely it wouldn’t be so slimy?” Well, I couldn’t get into the kitchen fast enough to try. As it turned out, cutting the okra in julienne slices was the most time-consuming part of this otherwise very easy recipe. Using a very sharp knife made the task not only easier, but also lessened the sticky substance that normally oozes out of these pods. Instead of tossing the strips with the traditional cornmeal, I decided a bit of flour would be more appropriate. I wanted them to be delicate — and that is exactly how they turned out! 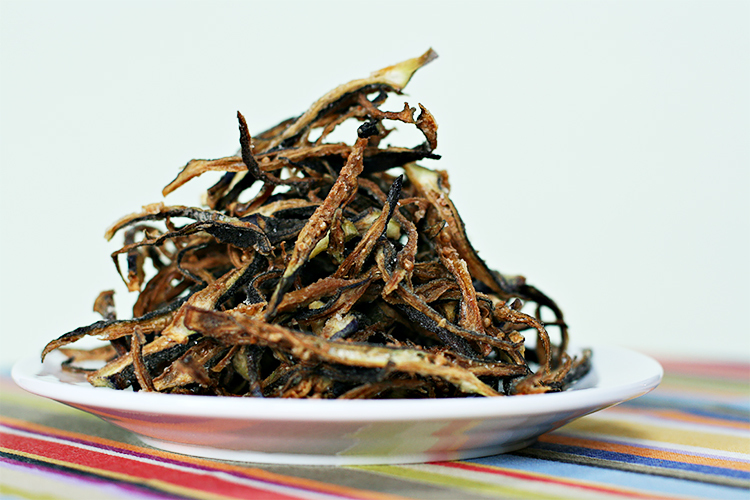 Crispy and still a bit chewy, with a delicate but unmistakable okra flavor, these shoestring fries were so addictive that Marc (my husband) and I devoured the whole plate in a blink! I find that a crisp Cava or Prosecco is the best companion for these shoestring fries, unless of course, you feel like serving a cocktail with them. In which case I would recommend this peach-ginger mojito. 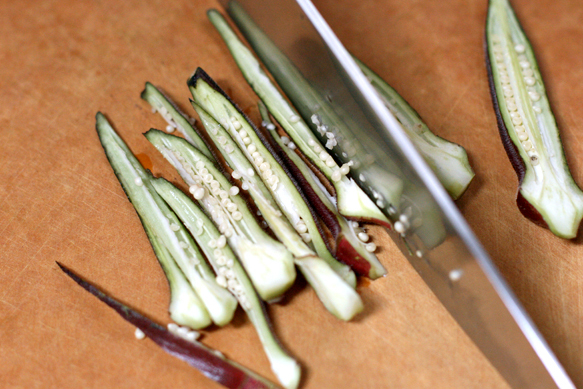 Step 1: Using a very sharp knife, cut each okra pod in half lengthwise. Then cut in 1/8” julienne strips. Place the okra slices in a bowl and sprinkle with the flour. 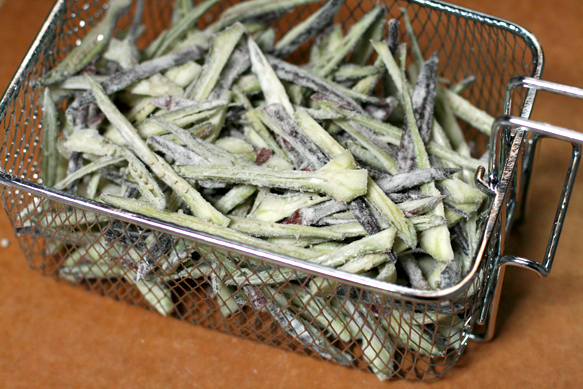 Toss well until the okra slices are well coated with the flour and set aside. Step 2: Heat a deep fryer to 375ºF (190ºC). 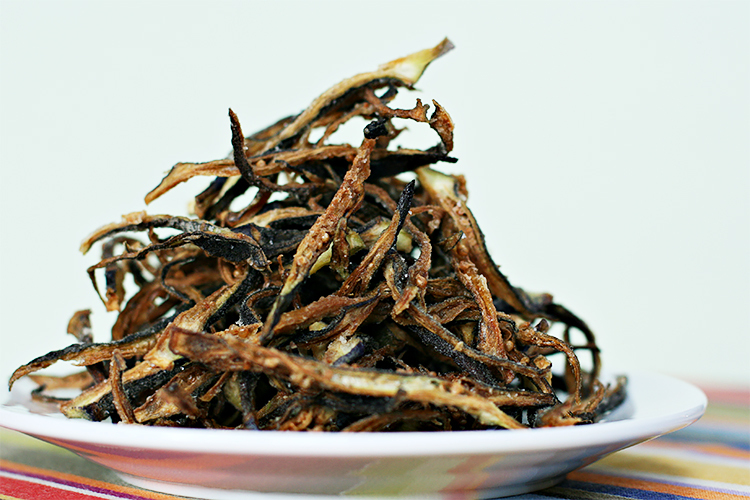 When the oil is ready, place the okra slices in the basket, being careful not to overcrowd it and fry for 6 to 8 minutes until golden-brown. Remove from fryer, drain on paper towels. 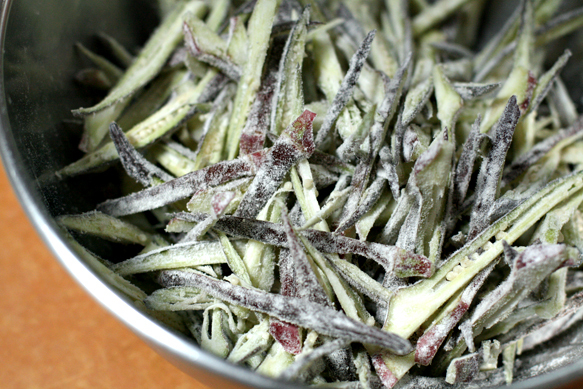 Sprinkle the okra fries with sea salt and serve immediately. Place the okra slices in a bowl and sprinkle with the flour. Toss well until the okra slices are well coated with the flour. 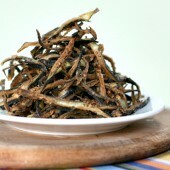 Place the okra slices in the basket, being careful not to overcrowd it, and fry for 6 to 8 minutes until golden-brown. My husband and I own a farm where we grow organic heirloom plants. This year we planted burgundy okra and it’s been a big hit at the farmer’s markets. But it’s not the fact that you julienned and fried the okra that made them less slimy. The burgundy okra is less slimy than the green in general, no matter how it’s cooked. That’s one of the things we tell all of our customers and is a huge selling point. I use the green okra for traditional frying or for gumbo and soups and I use the burgundy for roasting or grilling. The slime difference is noticeable. I’m going to have to try this recipe. We’re always looking for more ways to cook our okra. Dear Lorie, Thank you so much for your comment and for stopping by. I had no idea that burgundy okra was different in texture than regular okra… but I’m delighted to hear it. 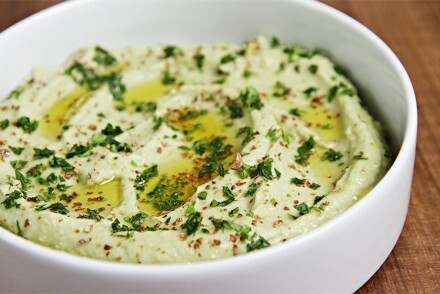 I’ve made this recipe with both kinds and the results were just as delicious and non-slimy. I so wish I could visit your farm in NC! Keep up the great work! 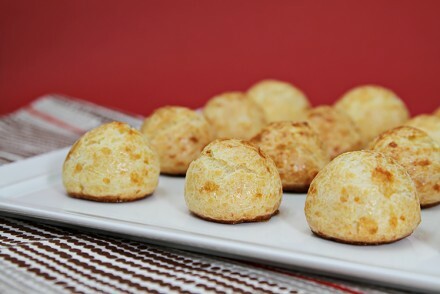 Oh Viviane, these look amazing! Once again I find myself salivating as I stare at your blog waiting for it to manifest a plate of these on my desk. Sadly, this is not happening! I have never seen purple okra and just made green okra for the first time. I read that flash frying the okra would eliminate the slime and honestly, I am not sure if it worked or if the slime just merged and was covered by the spicy tomato broth I cooked the flash fried pieces in. Anyway, I did enjoy it and now I am wondering if I will have the patience to julienne a bunch of the little buggers to try this tantalizing recipe. Jill! Oh my goodness… you made me laugh, yes, out loud! I totally sympathize about the slime factor. I haven’t published any other recipes with okra because I haven’t been able to do come up with another way that i would want to eat it. I wonder if slicing the pods in half (or quarters!) and then frying them would do the trick. This way you wouldn’t have to “julienne the little buggers”! I think I might give it a try… Good luck my dear and, as always, thank you so much for stopping by. hey im visiting your blog for the first time and i came upon this recipe. I love okra and living in Pakistan we have it quite regularly i fell in love with burgundy coloured ones…….wish they were available here. What i wanted to tell you that was u can also also fry the green ones like you did toss them in chopped onions and salt and chilli and whenever we make them in gravy (pakistani style) we always deep fry the sliced okra for a few minutes its like blanching them in hot oil…….this will remove some of the slime!!! and then mix them in the gravy. the oil will become very thick and slimy when u cool it u can throw the oil or use it in making some other veg! I recently had pickled okra at a restaurant and it was so delicious–crispy and crunchy, not slimy at all. I wish I knew how to make this as I also look wistfully at the okra in the markets but have no idea what to do with it. Wow! Love your enthusiasm for cooking! These sound amazing – very clever! It’s my first time reading your blog and I love it! I’ve never seen burgundy okra before. I like okra and this recipe looks delicious. Awesome idea! I never would have thought this one up, but I really like okra and I can imagine that these fries are delicious! Never knew okra could be burgundy. My husband loves fried okra and I know he would like this recipe. Now THIS is innovation at its finest. What an awesome idea! Okra is a staple in Brazilian cuisine…Try adding white vinegar to the okra the next time you cook and and do not over mix it when cooking it – it reduces the slime almost completely. Keep on creating delicious recipes! Marcella! Thank you so much for the tip. I’ll try it for sure as okra season is about to get in full swing. Thank you also for your kind words… I’ll keep on creating for sure! I’m delighted you enjoyed your time on the blog. Happy cooking! What a great idea…. I’m not a big fan of okra but I’m sure I would love that. Looks delicious. If you liked yopur fried okra so much, try “Crispy Okra Salad” from chef Suvir Saran. Abfab!! I make it regularly now. just discovered your site..amazing photos and unique recipes! We’re readers now! What a great blog you have! This is my first visit and I admit, I was taken in by those gorgeous okra. I’ve never seen that color before and I’m intrigued! I like them fried, but the slime factor keeps me from making them. Although I was recently thinking of trying them pickled… and the purple/green together would be really pretty in glass jars. Whenever I think of okra, I think of my sweet Aunt Janet, cooking/frying/baking something delicious in her North Carolina kitchen. I miss her. Thanks for the memory, and for introducing me to burgundy okra. So, I don’t really care for okra, either. Except for fried okra, which still has the ‘s’ factor as you pointed out. However, all summer long, we’ve been growing this burgundy okra in a pot outside my kitchen door. It’s gorgeous! But, all I’ve done is snap them off and decorate my vegetable bowl with them. The guilt is beginning to sink in. I think I can do this and I think you’re so right– “frenching” them just has to be the answer! Kim, If you try the shoestring fries, do come back here and tell me how you liked them. I’ve been making them quite often now and even my husband loves them! I sure hope you like then… BTW you have a gorgeous and fun blog! Thanks so much for your comment… I’m always grateful for them! You have such a beautiful site!! I just bought okra for the first time. I made a corn and black bean salad with it and jambalaya, but I wish I found this recipe!!!!! So creative! I love that you went ahead and bought the okra even though you thought you didn’t like it!! I’ve always liked it fried and in gumbo – maybe I’ll try growing it next year. Being a southern boy at heart, I have always loved fried okra. I’m going to buy some and try out your recipe! I agree with you on okra. The slime factor really stops me from eating it. But I love the idea you came up with. Anything, that is shoestring and fried must be delicious. Gorgeous okras. And I’d love to munch on some of those shoestring fries! I love okra! What a wonderful idea!